There are a lot of benefits to being a condominium owner, but you are also exposed to unique risks. Unlike owning a single-family home, you have a number of policies in force between your personal insurance and the community insurance. You need to make sure that this insurance overlaps so that you’re protected from any risk. Contact Secure Insurance Solutions today for your free quote! And if you’re renting a condo you need to make sure that you have rental insurance. With various policies in place, you need to make sure that you don’t overpay for unneeded insurance–already covered by the master insurance plan–and that you have extra liability insurance where the master insurance stops. The master insurance also doesn’t cover your personal property. What happens if your furniture, clothing and other valuables are damaged because of a fire in your unit? It also doesn’t cover damage to any upgrades you’ve made since the original unit was built. After you invest money in those changes, you want to make sure you’re protected. Your condo is in a communal setting but your condominium insurance needs to be individual or your may be paying too much and you probably have great liability risk. But if it’s too small, you may be exposed to a lawsuit. 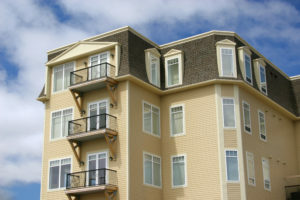 If you own property in a development with joint property ownership, we can get you Condo Insurance at reasonable rates. This insurance works in conjunction with your association’s insurance policy. It’s important for your protection to have your condominium insurance or rental insurance in place before any claims are made–not just from you but also from anyone else on the condominium property. We can provide you with a no-risk quote within a day. Just click on our Free Quote request button to find out how to protect you and your home.